Taylor Swift’s declaration that she plans to vote for Democrats next month fell like a hammer across the Trump-worshipping subforums of the far-right Internet, where people had convinced themselves, for reasons it will take some time to explain, that the world-famous pop star was a secret #MAGA fan. Missives about Swift’s perceived betrayal of conservatism clogged far-right message boards. Some simply refused to believe what she had written to her 112 million Instagram followers Sunday evening — a 400-word condemnation of “systemic racism,” homophobia and Rep. Marsha Blackburn, the GOP Senate candidate in her home state of Tennessee, complete with Swift’s endorsement of two Democrats: Phil Bredesen, the party’s Senate candidate, and Rep. Jim Cooper. That a 28-year-old celebrity — even one who had previously kept her politics private — would weigh in on a potentially crucial midterm election seems much less strange than the story of how the far-right Internet came to believe Swift was their secret ally — “our girl,” as many put it. 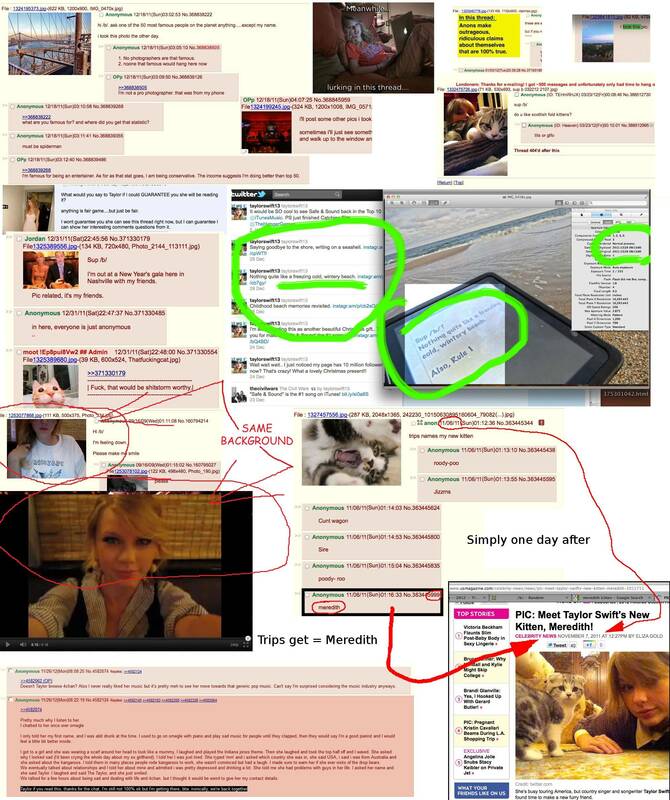 The delusion traces back to the middle of the Obama administration, 2011, when a certain fraction of 4chan users convinced themselves that Swift had let them name her cat. Among the hundreds of thousands of posts written on 4chan that November, one was a kitten-naming contest. The winning name was Meredith, which — lo and behold — was also the name of Swift’s new kitten, according to a People Magazine article that 4chan users subsequently passed around in astonishment. Probably not many people believed Swift was a Nazi — but between the 4chan rumors and the Daily Stormer memes, a vague but widespread belief spread across right-wing circles that the star was on their side. More than swooning — they were expecting. “Taylor Swift will soon come out of the MAGA closet,” reads a typical post from that era on The_Donald, complete with a doctored photo of the star in a “Make America Great Again” hat. To be sure, there were warning signs, if anyone cared to look. “I’ve never seen this country so happy about a political decision in my entire time of being alive,” she told Rolling Stone at age 19, after the election of Barack Obama. She came out for gun control in March. She was shown on Time magazine’s “Person of the Year” cover in 2017 as one of the “silence breakers” fighting back against sexual harassment. The cover story cited her legal battle with former radio DJ David Mueller, whom she accused of sexual misconduct. But hope springs eternal until it suddenly goes dry, which it did abruptly Sunday night. MrGreggle redistributed his allegiance to the libertarian punk musician Michale Graves after seeing Swift’s Instagram post. Another regular on The_Donald who had once sung her praises claimed he didn’t listen to her. And where there was not despondency, there was anger. Maybe. Even on a good day, 4chan’s overtly misogynistic /pol/ board is awash in rants from men angry at “feminists” and “social justice warriors” they believe have taken over society. As you’d expect, the mood was more foul than usual after the forum’s imaginary protege declared her real feelings. The Washington Post’s language policies prevent linking to most of what 4chan had to say.